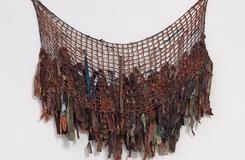 Harmony Hammond included in Queer Threads, curated by John Chaich at Mills Gallery, Boston Center for the Arts. Boston Center for the Arts (BCA) presents Queer Threads: Crafting Identity and Community/, featuring 26 artists from four continents who remix fiber and textile craft traditions and materials to explore contemporary lesbian, gay, bisexual, transgender and queer identities and ideas. Loaded with gender connotations, feminist herstories and tactile experiences, the featured works utilize handicraft—including crochet, embroidery, knitting, macramé, quilting and sewing—as a platform for examining tastes, roles and relationships socialized within and around gay and lesbian culture, as well as the bodies, cultures and spaces that shape us.